Foliage by Elliott Sharp is a long-form graphic music score that offers abstract instructions allowing for infinite possible interpretations by performing musicians. Featuring a series of 80 risograph prints, Foliage is, in Sharp’s words, “a graphic score open to interpretation and realization by any instrumentalist or ensemble of any size… [it] is a piece of retinal art as much as it is an instruction set for sound, form and function interlocked.” Graphic notation, which evolved during the post-1945 avant-garde, experimental music scene, falls outside the realm of traditional music notation; it is the representation of music through the use of visual symbols. Foliage exists at the intersection of musical composition, art installation and performance – Sharp’s score is brought to life by the distinct singular interpretation of each musician who performs it. A central figure in the avant-garde and experimental music scene in New York City since the late 1970s, Sharp has worked intermittently with graphic notation since 1972 but began to immerse himself in the medium again a decade ago. 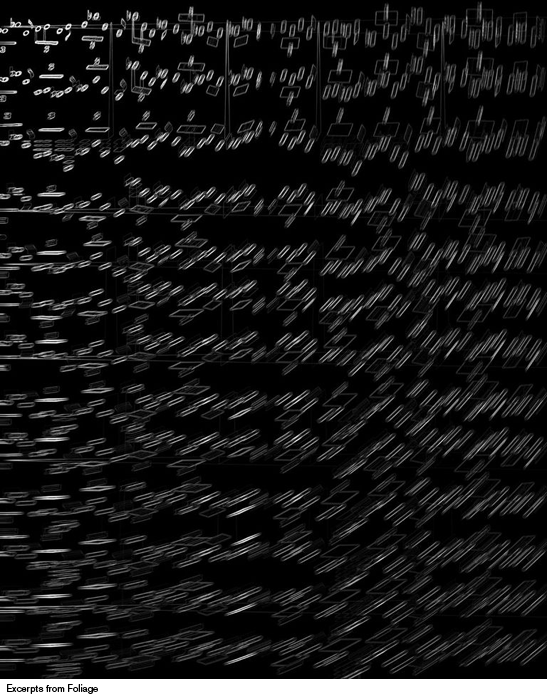 Analogous to his use of audio editing software during live performances to modulate and distort sound, Sharp’s technique in creating Foliage was to use graphics editing software to process musical notion (that he himself composed) to distort, layer, invert, blur and ultimately explode traditionally written sheet music, in turn creating visual works of art. **Performances from 5/18 – 5/25 will have a $10.00 entrance fee. The opening on 5/17 and closing on 5/26 will be free of charge. In Foliage, design and spontaneity become one by engaging the creativity of the interpreters. Elliott is not only interested in blurring the distinction between structure and improvisation, but also between digital and analogue. Electronics are not only tools for him to extend the potential of acoustic instruments, but are also a new way to write music. This balanced approach lets him retain a tactile and acoustic quality in live performance. I find that musicians often come up with images that visual artists would not create, because they have the advantage of “hearing images,” a synesthesia that comes from years of practice and playing, a unique synchronization between the eyes, the hands, and the instrument. Through this transposition from sound to image and back, Foliage will inspire musicians to play what they see and make audible what Elliott hears in his graphics. Elliott Sharp was classically trained in piano and clarinet from an early age then began playing guitar as a teen, delving into rock, blues, jazz, and experimental modes. He attended Cornell University from 1969 to 1971, studying anthropology, music, and electronics. He completed his B.A. degree at Bard College in 1973, where he studied composition with Benjamin Boretz and Elie Yarden; jazz composition, improvisation, and ethnomusicology with trombonist Roswell Rudd; and physics and electronics with Burton Brody. In 1977 he received an M.A. from the University at Buffalo, where he studied composition with Morton Feldman and Lejaren Hiller, and ethnomusicology with Charles Keil. From the late 1970s, Sharp established himself in New York’s music scene as a performer, composer, improviser, and producer. His compositions have been performed by Hilary Hahn, the HR-Sinfonieorchester, the Ensemble Modern, Continuum, the Orchestra of the SEM Ensemble, Kronos Quartet, the FLUX Quartet, Zeitkratzer, the Soldier String Quartet, the JACK Quartet, and the Quintet of the Americas. His work has been featured at festivals worldwide, including the 2002 Darmstadt Festival, 2007 Donaueschingen Festival, 2008 New Music Stockholm festival, the 2007 Hessischer Rundfunk Klangbiennale, and the Venice Biennale 2003 and 2006. Sharp’s collaborators have also included pop singer Debbie Harry; Qawwali singer Nusrat Fateh Ali Khan; Ensemble Resonanz; cello innovator Frances Marie Uitti; blues legends Hubert Sumlin and Pops Staples; pipa virtuoso Min-Xiao Feng; jazz greats Jack deJohnette, Oliver Lake, and Sonny Sharrock; multimedia artists Christian Marclay and Pierre Huyghe; and Bachir Attar, leader of the Master Musicians Of Jajouka. Sharp has composed scores for feature films and documentaries; created sound-design for the Museum of Natural History and interstitials for The Sundance Channel, MTV and Bravo networks; and has presented numerous sound installations in art galleries and museums. He is the subject of a new documentary “Doing The Don’t” by filmmaker Bert Shapiro.